Dr. W. D. Coolidge (1973-1975) was one of the most important innovators of the 20th century in his field. 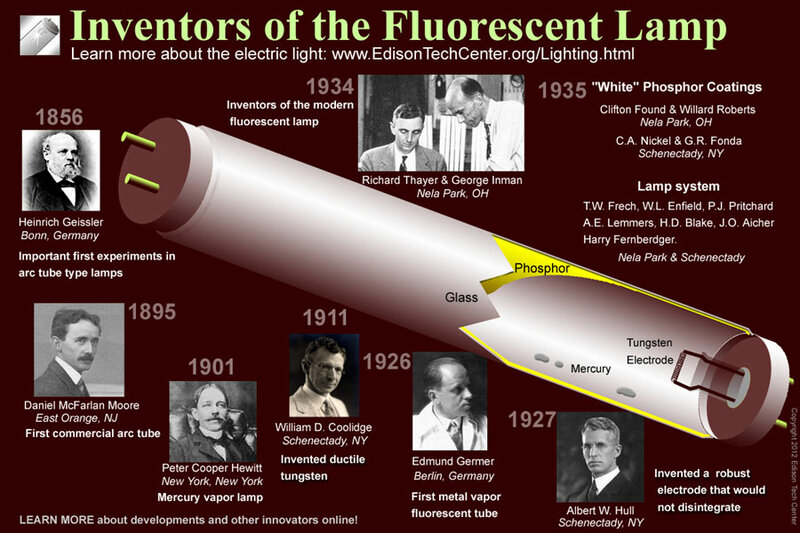 Coolidge developed the ductile tungsten filament used in lightbulbs, fluorescent lamps, car ignitions and vacuum tubes. He worked on transformers and cathode ray tubes, high vacuum tubes and he was one of the early leaders at the General Electric Research Lab. He had a remarkable understanding of physics and made improvements to many technologies. Tungsten filaments replaced tantalum filaments in 1911 and have reigned as the filament of choice ever since. Before Coolidge's work lightbulb filaments were made with more fragile sintered tungsten, tantalum, bamboo, and carbon. Tungsten allowed the bulb to last longer and produce brighter light. William Coolidge was born October 23, 1893 at Hudson, Massachusetts. Entering Massachusetts Institute of Technology he elected to major in electrical engineering. During his college years he learned something of the metal-working trade in the machine shop of a friend in Hudson. There he built the parts of a large static machine which he sold to a local doctor for X-ray work and which subsequently was moved to a permanent place in the Ford museum, Dearborn, Michigan. After graduation he went to Leipzig, Germany where he received his Ph.D. in 1899. Returning to the United States, Dr. Coolidge went back to MIT. For five years in association with Professor Arthur A. Noyes, he did fundamental physico-chemical research. Dr. Coolidge joined the General Electric Company's Research Laboratory on September 11, 1905 at Schenectady. 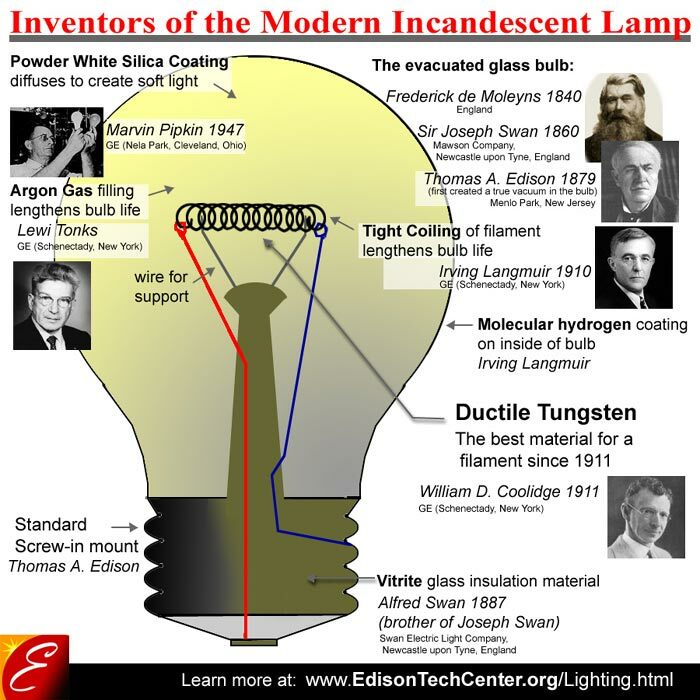 He played a leading role in making the incandescent lamp what it is today, for in the fall of 1908 he produced what no man had ever before seen: ductile tungsten. It had all the properties of wire capable of being drawn down to only one sixth the diameter of a human hair. By 1911 he had discovered a low cost way to manufacture the material and thus lighting was changed forever. Dr. Coolidge's ductile tungsten was the basis of many more discoveries. A search for other applications of this new metal led to its use in a car's ignition contacts. Here Coolidge found it to be so superior to platinum or silver that today it is almost universally employed in automobile ignition systems. Once he had solved the riddle of the incandescent lamp, Dr. Coolidge began investigating the applicability of ductile tungsten to X-ray tubes. He devised a technique for vacuum-casting copper in good thermal contact around a tungsten disk to conduct the heat away. Tungsten was universally used for targets, except in a few tubes used for special purposes. This however, was far from his greatest contribution to the X-ray science. When Dr. Irving Langmuir demonstrated the possibility of a pure electron discharge in high vacuum, Dr. Coolidge perceived the possibility of a radically new type of X-ray tube. Triumph he did and the Coolidge X-ray tube soon substantially superseded all previous types. The use of X rays became a science instead of an art. During the first World War he developed a device known as the "C" (for Coolidge) tube for detecting submarines. This was followed by the development of a second detector, known as the "K" tube, which was a drifter set, free from the water noises that reduced the range of the "C" tube in rough weather. But the "C" tube was only one of Dr. Coolidge's contributions to the war effort. His other was the development of a small, powerful portable X-ray generating outfit for use in field hospitals near the front. This outfit, in turn, led to the development of one so small, light and readily assembled that a doctor could easily transport it in his coupe and set it up at a patient's bedside. Another development along the same lines was a very small self-shielded, self-rectifying tube, and a small 56,000-volt transformer, both of which could be placed in an oil-filled, tightly sealed case. This permitted for the first time a wholly safe, convenient and adequate X-ray outfit for the dentist. Along with this development of X-ray tubes, Dr. Coolidge carried on studies of high-powered cathode rays. He became assistant director of the General Electric Research Laboratory in 1908, associate director in 1928, director in 1932 and vice president and director of research in 1940. In December 1944 Dr. Coolidge retired as vice president but continued in a consulting capacity. 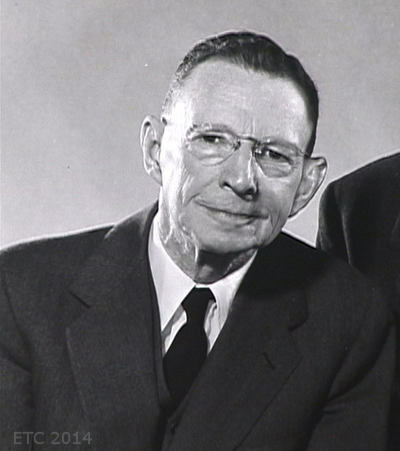 In September 1946 he returned as head of the new division of the Research Laboratory at the Hanford Engineer Works, Richland, Washington. In 1937 he received from the University of Zurich an honorary M.D. degree in acknowledgement of his outstanding achievements in the field of applied physics in medical science, particularly in the field of X-rays. Only one or two other laymen in this country have been so honored. He has also been awarded Doctor of Science degrees from Union College (1927) and Lehigh University (1927). 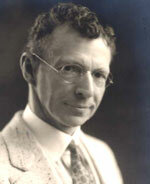 Dr. Coolidge was a Term Member of MIT from 1930 to 1935. He was also a member of the Visiting Committee of the National Bureau of Standards and a member of the National Inventors Council, a body created in 1940 to encourage and investigate inventions that might prove useful in the war effort. He belonged to the National Academy of Sciences, the American Academy of Arts and Sciences, the Washington Academy of Sciences, the American Association for the Advancement of Science, the American Chemical Society, the American Electrochemical Society, the American Institute of Electrical Engineers, the American Physical Society, the American Institute of Chemists and the American Philosophical Society. Left: Coolidge in the 1950s. He worked until the end of his life. He enjoyed the hands-on aspect of engineering and continued to work with projects until 100 years old. He was an honorary member of the American Roentgen Ray Society, the American Radium Society, the Radiological Society of North America, the American College of Radiology, the Dental Society of the State of New York, the Roentgen Society (of England), The Societe de RAdiologie Medicale (de France), and the Nordisk Forening for Medicinisk Radiologi (Scandinavia). When Coolidge died in Schenecdady in 1975 at the age of 101, he held a total of 83 patents. He was well loved by his community and coworkers. He had provided a venerable voice in the tight-knit community of the research and engineering labs often called "the GE Family".